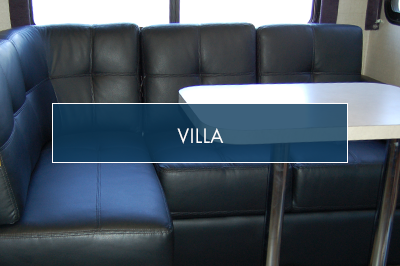 RV furniture needs to be comfortable as well as attractive and functional. How about yours? Is your furniture in disrepair or upholstery threadbare? Does the sofa sleeper aggravate your neck and back problems? Are the pilot seats broken or pitched too far forward? Is the recliner too big and bulky? Do you hate the colors and is it so yesterday? The state of your furniture is a prime factor determining how you view and feel about your coach. If you are unhappy with your furniture, chances are you won’t love your coach. Instead of looking to replace your coach, new or reupholstered furniture will make it new again with less heat on the pocket book. At Classic Coach Works we source, stock, and install stylish and functional RV furniture to meet your exact needs. We are proud to be official stocking dealers for Flexsteel Industries and Villa International, the top two leading RV furniture manufacturers in the country. 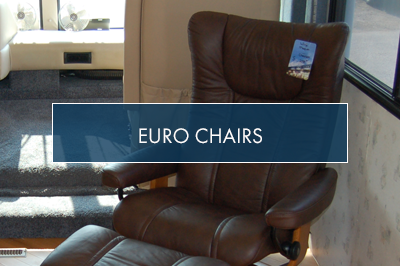 Recently, we were delighted to have been chosen to carry the famous Ekornes line of comfort furniture. Many of our customers choose to have us reupholster and repair existing pieces. We also have the capability to produce custom wood and upholstered furniture to provide unique designs with functional solutions. 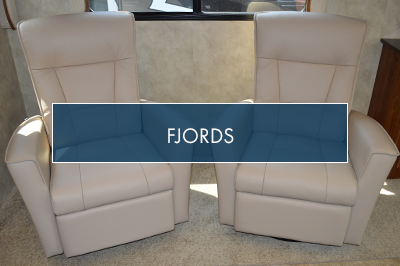 RV furniture is unique – sofas need to fit through narrow entrance doors, pilot seats need to meet safety standards, dining booths need to fold down into beds, recliners need big comfort in a small space. Is your furniture doing what you want? When it’s not, call us or drop in. Discover all your options. At Classic Coach Works you will be delighted to find sofas, loveseats, pilot seats, recliners, booths, dining tables and chairs that you can actually see, touch and try. Come and browse our ever-changing, exciting showroom.